A leader of the campaign to find the missing Ayotzinapa students in Mexico told Workers World, “No one wants to leave their homes, but war and violence sometimes force us to do just that.” The demonstration was at Houston’s busiest intersection in the most crowded shopping area and the response from passersby was positive. 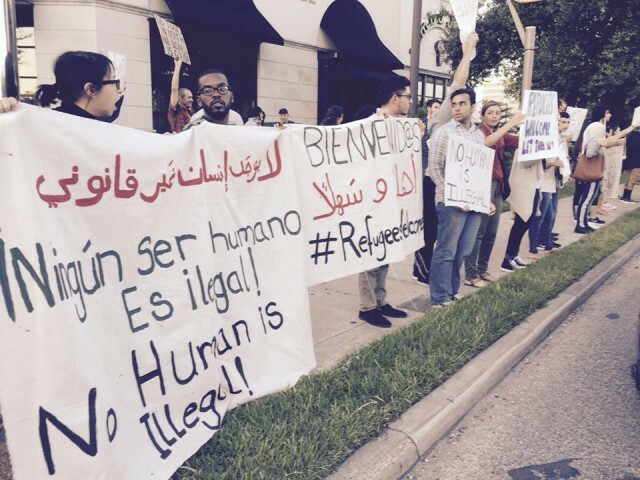 Signs and chants were in English, Arabic and Spanish. News coverage was broad on both English- and Spanish-language television. One man who was interviewed, Israel “Izzy” Torres, had been fighting his own deportation for almost two years. Just a few days after he attended this demonstration and appeared on television, Immigration and Customs Enforcement did deport him to Mexico, where he knows no one. He and his partner have lived in Houston for over 20 years and all their children are U.S. citizens. The theme of the Sept. 12 action was “Refugees welcome! No human is illegal!” The demands were for the European Union member states to end immediately their dehumanizing and repressive practices and allow free access and movement of refugees and migrants to reach the destination of their choosing, without fear of coast guard patrols, borders, fences or cages. Also, for Washington to do its part in welcoming and resettling refugees in the U.S., and for the Obama administration to pledge to accept at least 65,000 refugees from Syria for resettlement in the U.S. by 2016.